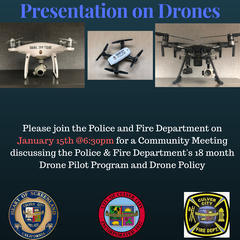 On behalf of Chief Bixby, you are invited to attend the Police Department’s presentation on CCPD’s Unmanned Aerial Vehicle Pilot Program (Drones). Community members are encouraged to attend and offer their views and opinion on this program and policy. For questions regarding the presentation, please contact Lieutenant Dunlap (310) 253-6258.